This entry was posted in Uncategorized and tagged animal, hawk, laurinaitis, legion of doom, nwa, paul ellering, road warriors, tag team, wcw, wrestlers, wrestling by Chris. Bookmark the permalink. 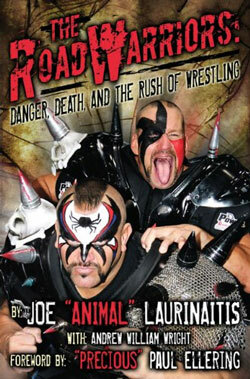 I loved the Road Warriors when I was a kid. Them, Bam Bam Bigelow, Andre the Giant, Jake the Snake, and the Von Erich family were the reasons I stayed glued to the television whenever a match was on. I remember when I was a kid, around eight or so, our city fair had an auction going to win Kerry Von Erich’s boots. I bummed money off everyone I came across to buy ticket after ticket. Even though those boots were massive compared to my shoe size at the time, I would have given anything to have something from the Texas Tornado. Sadly, I didn’t win, but thinking back on it now, I can’t help but appreciate how much I loved wrestling as a kid. I would have worn those giant boots everywhere. Hell, I would probably still be wearing them now (only for special occasions, of course). That would have been awesome…imagine the fun you could have gotten yourself into had you won Bruiser Brody’s fur boots!